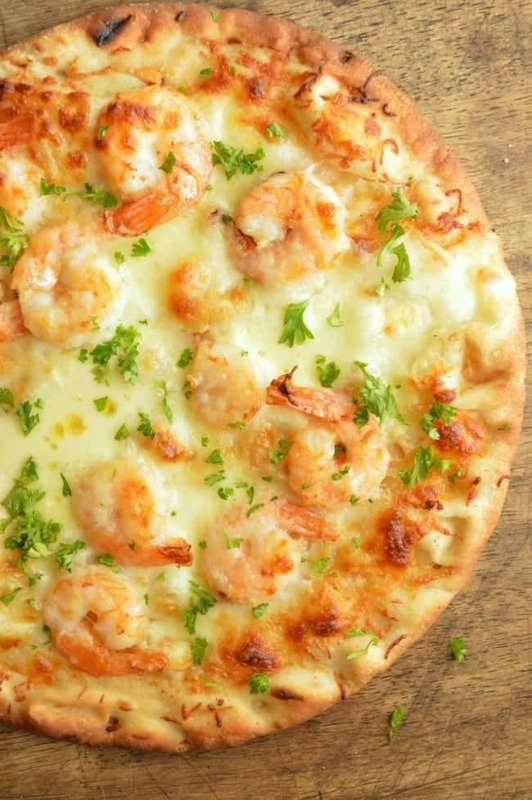 If you love garlic and buttery shrimp, this Shrimp Scampi Flatbread is for you! A quick, simple recipe that is packed with buttery garlic flavor and melty mozzarella cheese. In just a little more than 24 hours it is going to be 2016. I feel like an old lady saying “Where did the time go?” But seriously though — where did it go? 2015 has been a pretty great year — BUSY to say the least, but pretty doggone fantastic. I started this year off with a variation of burgers (Breakfast Burgers with Maple Sriracha Aioli to be exact) so I thought I’d end it with a variation of pizza. You can never EVER go wrong with burgers or pizza. 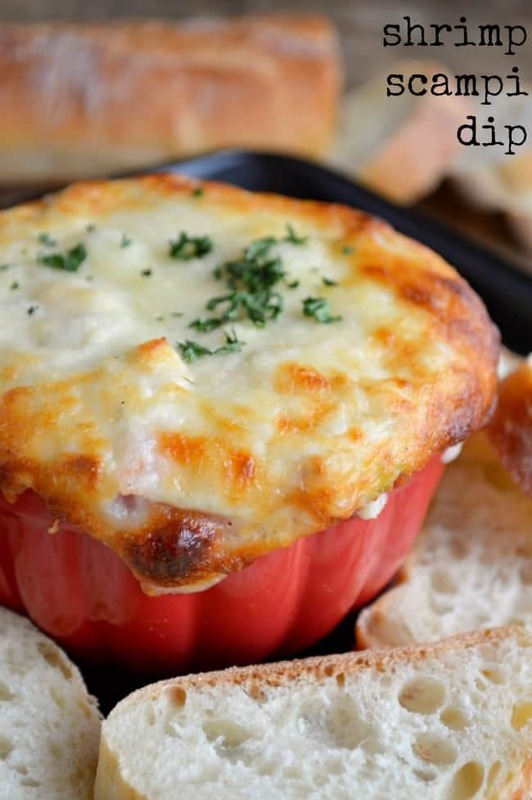 Another great thing to come out of 2015 was Shrimp Scampi Dip. You guys went bonkers for that cheesy happiness. 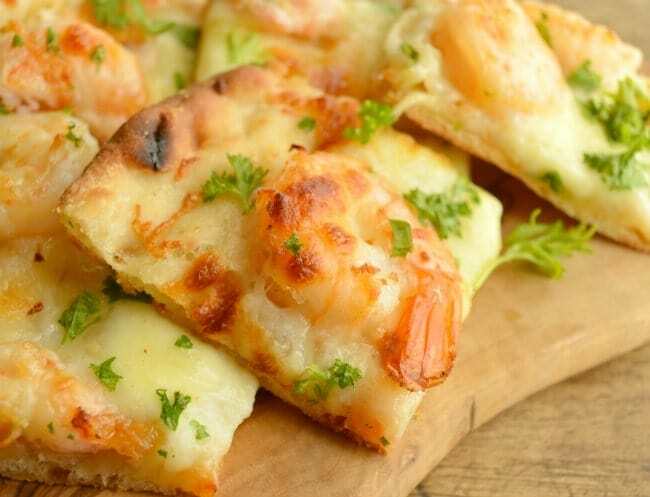 So I let those flavors live on in this Shrimp Scampi Flatbread. You are basically making this Quick Garlic Shrimp, but with more butter. More butter is winning. 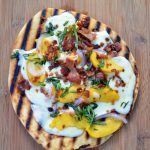 A quick mention on the flatbread — I used Stonefire and I LOVE them. They make naan, mini naan, pizza crusts, and pita chips! And they did not pay me one dime to tell you this (although occasionally a big box of flatbread shows up at my house and I do quite like that). Seriously though — I can make my own flatbread, but once you find a good store-bought brand you can roll with, you kind of have to. It takes this recipe from labor intense to EASY, super quick, and something you can throw together 5 minutes before people show up. One of these days you’ll have to remind me to tell you about the gift exchange we hosted before Christmas. Talk about needing food ready fast — OMG. I nearly lost my cool. This is your party appetizer for the coming season. Parties, game days, Wednesdays, days where garlic and butter need to be found in abundance — this flatbread recipe will be here to save you. Melt the butter and heat the olive oil in a medium saucepan. Add the shrimp, garlic, salt, and pepper. Cook over medium high heat, stirring occasionally, until the shrimp is pink and the garlic is fragrant, being very careful not to burn the garlic (about 5 minutes). Toss with the lemon juice. Tilt the saucepan to the side so that the liquid pools. Spoon it onto the flatbread and brush it so it mostly coats the crust, making sure to hit the edges (this will help it brown). 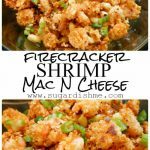 Sprinkle the cheese over the top and then place the shrimp. I like to tuck them into the cheese so it holds them in place. Bake for 7-9 minutes (or check your flatbread package for time instructions. Be sure to check your flatbread packaging for cooking temperature recommendations. They will vary from brand to brand, and will also vary based on whether or not you are using flatbread that is frozen vs. thawed. 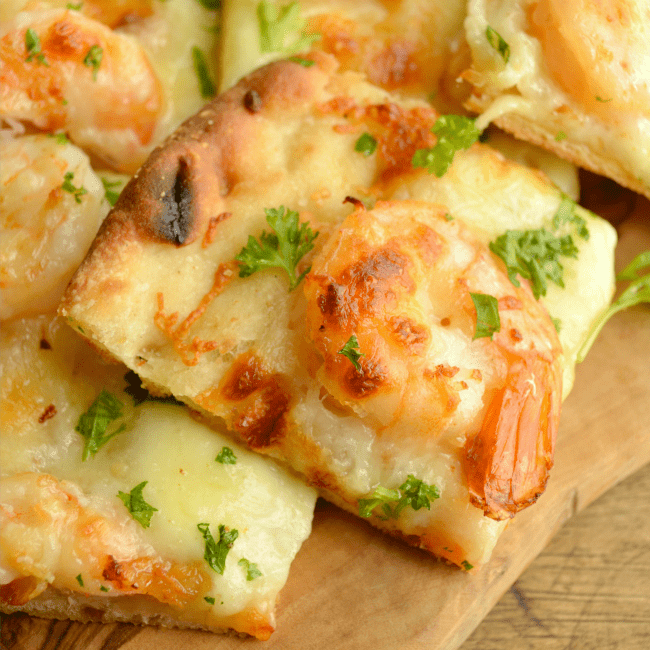 Your shrimp scampi flat bread looks good but…..tails on? I’m not fond of shrimp dishes like this where I either have to pick it apart to get the shrimp and pull the tail off or be eating it and having to take partially chewed shrimp out of my mouth to remove the tail. May look pretty for presentation but not for eating. Hi Cathy — thanks for your expertise on shrimp. I left the tails on for the photos because the flatbread is covered in cheese. I think common sense says you can take the tails off. Good of you to take the time to explain how to eat though. wow that seems a little passive. I have not seen flatbread at my grocery store, is this in the frozen foods with bread, or is there a mix that you purchase in a box? Or do you a brand name of the flatbread that you purchase. I really, really want to make this. Looks so scrumptious! Thanks so much for any information you can provide. I made this tonight, and I’m in love with this recipe! I will definitely be making this again. Thanks so much, April! I’m so glad you liked it! 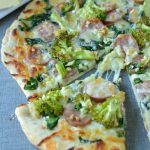 I’ve made this several times for pizza toppings parties and it’s always a huge hit. My pizzas are always everyone’s favorite! And it’s so simple to make. Thanks for the recipe!! Thank you so much, Louise! I appreciate the feedback! 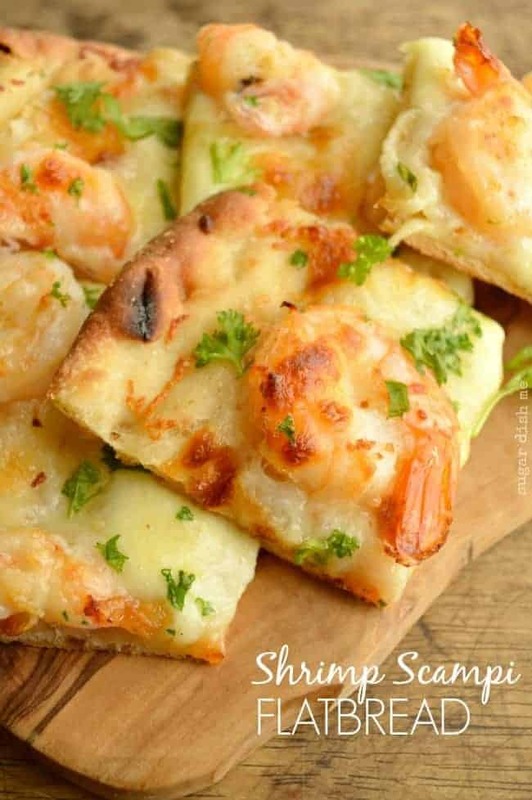 Oh, I cannot say enough about this shrimp scampi flatbread!! I have been meaning to rate it for months now! My niece and son requests this every time they come to my house! I make it for everyone and it is by far – THE BEST!! I even bring my left overs for lunch the next day and those aren’t bad either!! A must try for sure! 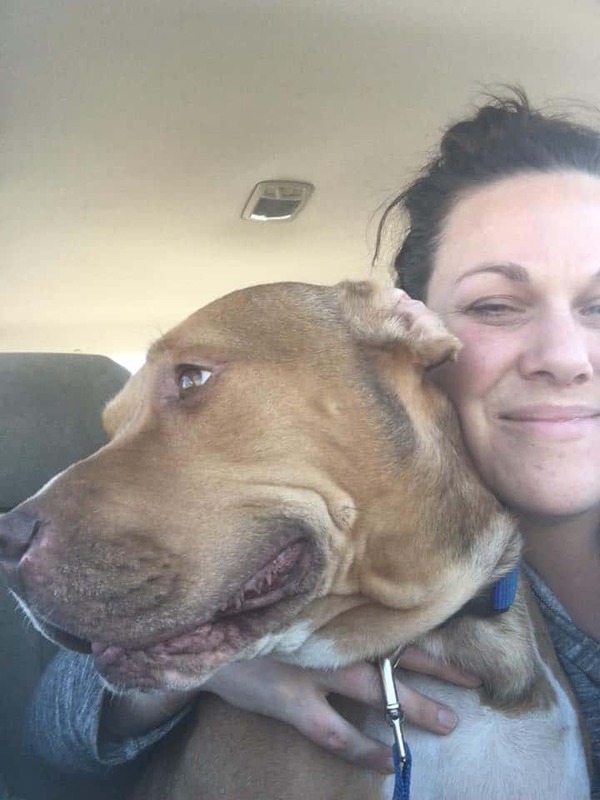 Thanks for sharing, Heather! Absolutely DELICIOUS! Thanks so much for the glowing review! So glad you are enjoying this! We make it once a week on individual Naan bread. My kids love it, and we can make it spicier for the people who like more red pepper flakes. Having it tonight with grandma!! Thank you so much, Stacey!! I can’t wait to try this for my family. I’m guessing by all the comments that the shrimp does not get over cooked when putting it on the pizza & in the oven after already cooking it? I don’t cook shrimp a lot but have always been cautioned about over cooking & have had over cooked shrimp. It was very chewy. Sooooo delicious! Wouldn’t change a thing. Just found your site and Wala, it looks to DIE for. Can’t wait to make this pizza, as just about any homemade pizza is a hit in our home. I will reply later. 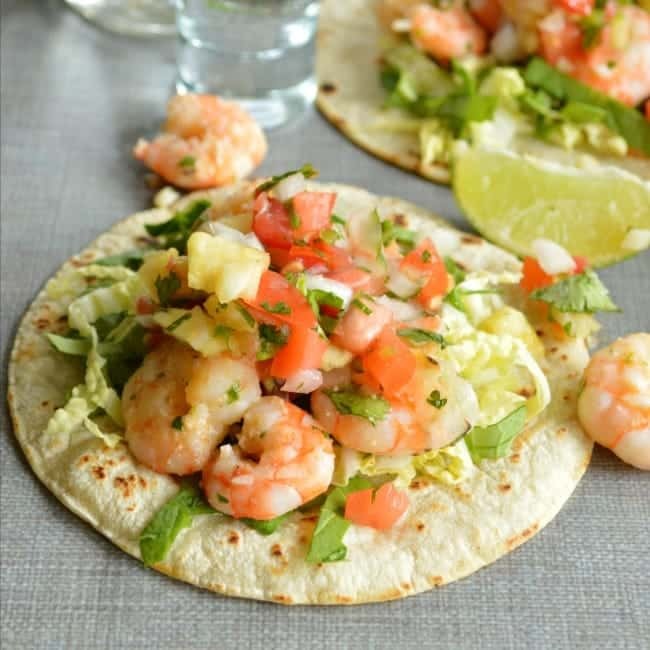 This is one of our go to recipes. We looooove it. 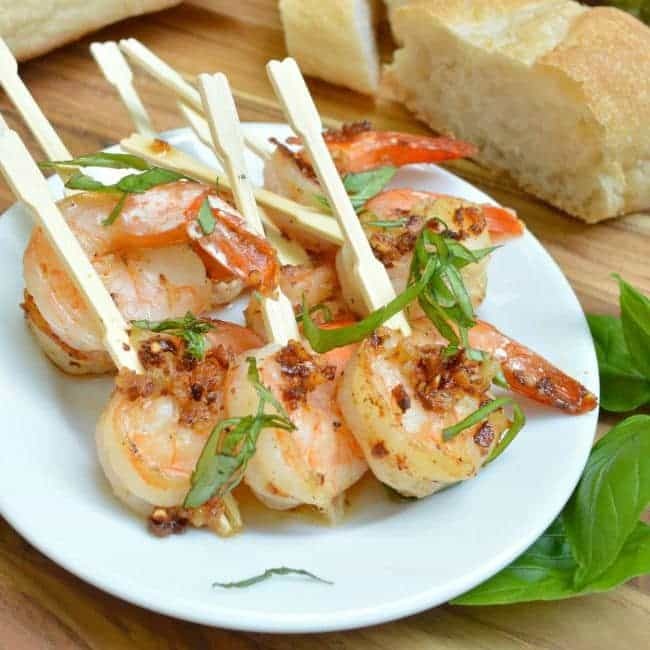 Sometimes – when I’m not starving – I take kitchen snips and cut the shrimp into bite size pieces after they’re cooked before going on the bread . I usually make this Saturday night after taking then teaching a yoga class – starving – last night they weren’t cut! 🙂 I eat one myself and my friend gets another. I’m not positive that this is a single serve recipe!! Ha! Thank you so much, Erin! Glad this is a keeper for you! 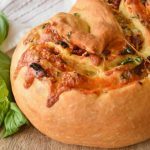 Just found this site…Great recipes. Will make the flatbread shrimp tonight. Sounds wonderful. Thanks, Mavis! So glad you are here!